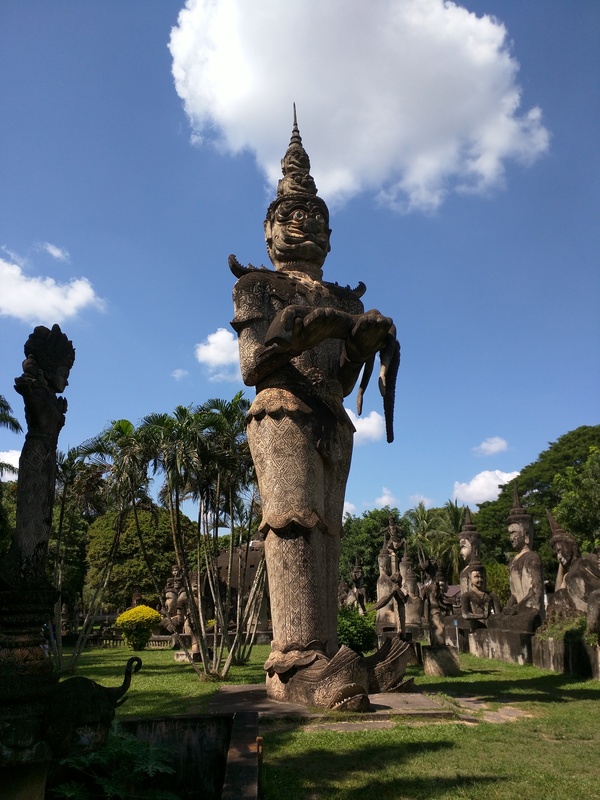 Vientiane is the capital of Laos and is pretty small compared to the other capital cities of Southeast Asia making it a great place to explore, there is plenty to see and you get to know the Laotian culture. 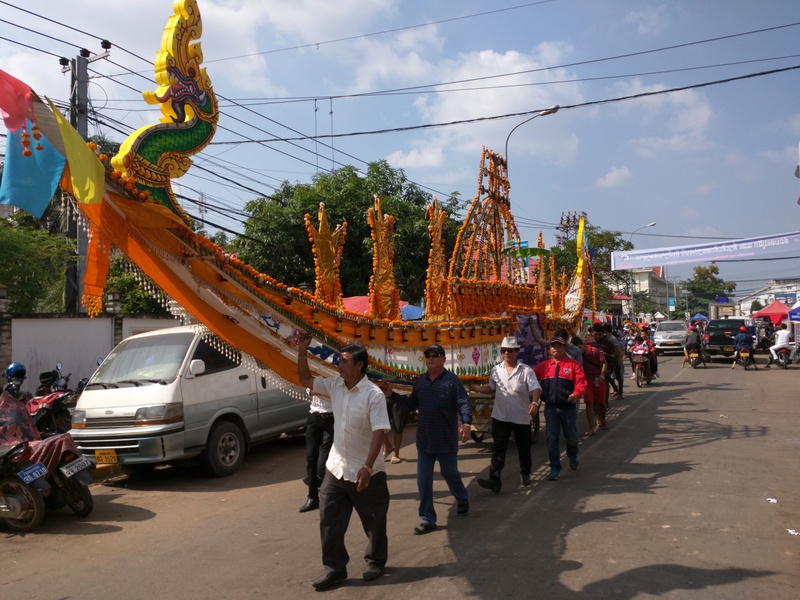 We were lucky enough to be in the city during one of Vientiane’s biggest festivals Bun Nam. The streets were packed with people and lined with tents selling all kinds of goods, making food, and running carnival games. 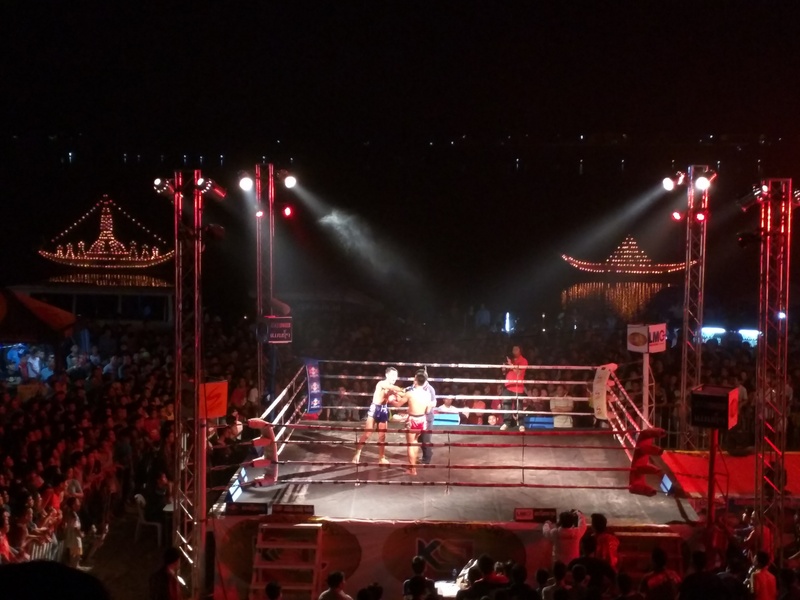 During the evening the stages were opened and concerts got going and a muay thai fight started. It was crazy loud because almost every tent had a few speakers either blasting music or egging people to come buy from their stall. It was madness. Along with the crazy party the main draw is the boat race that occurs the next day. 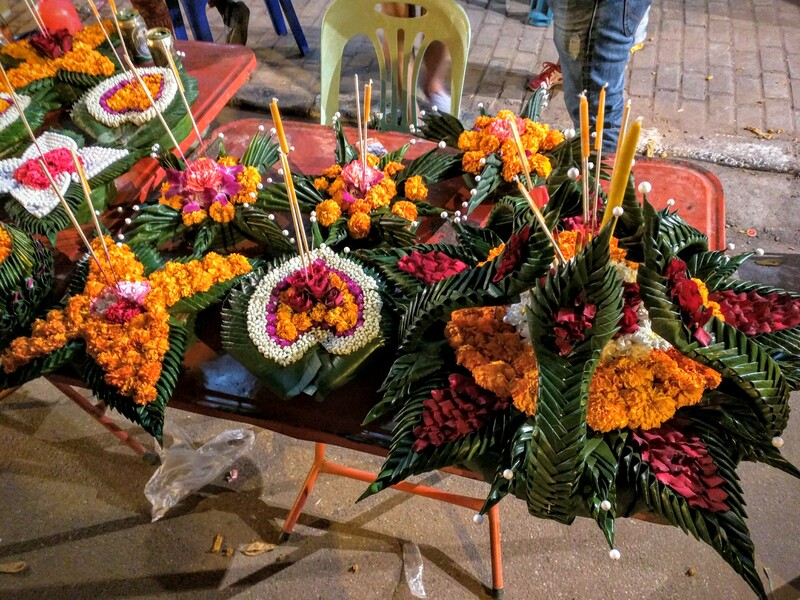 The night before Loatians make or purchase little boats made of bamboo leaves, flowers, and candles and take them down to the Mekong river where they say prayers and send the boats into the water. The boats are supposed to carry any bad out into the water and away from you. So of course we had to buy one and send it out into the water (we wished that any bad travel juju would be sent out into the Mekong). Boat headed to the Mekong. 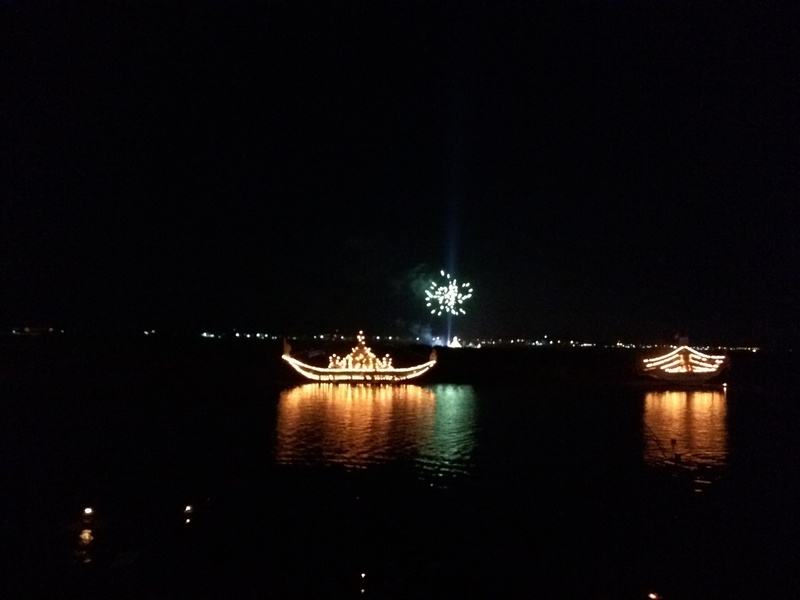 LIght up boats and fireworks on the Mekong. Bamboo boats. These are the super fancy ones. Made of bamboo leaves, flowers, and candles to float in the river. 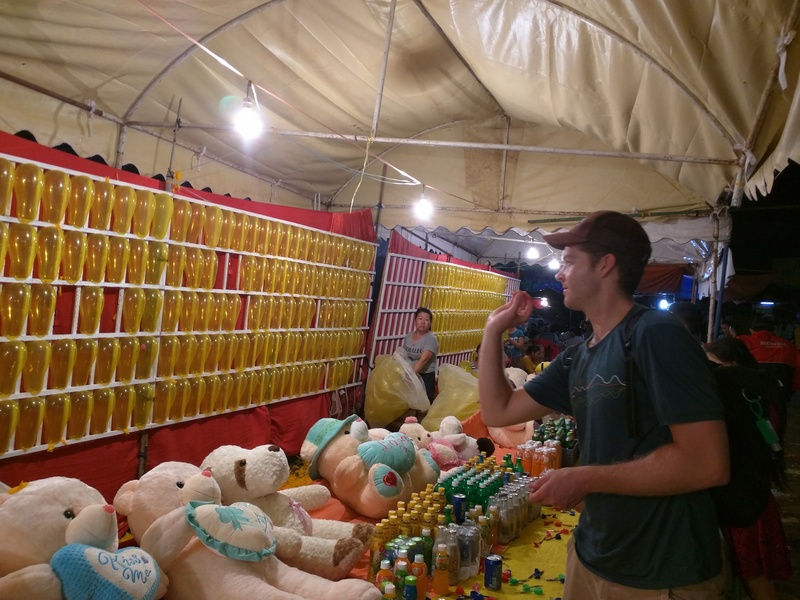 Dan winning at Laos carnival games. 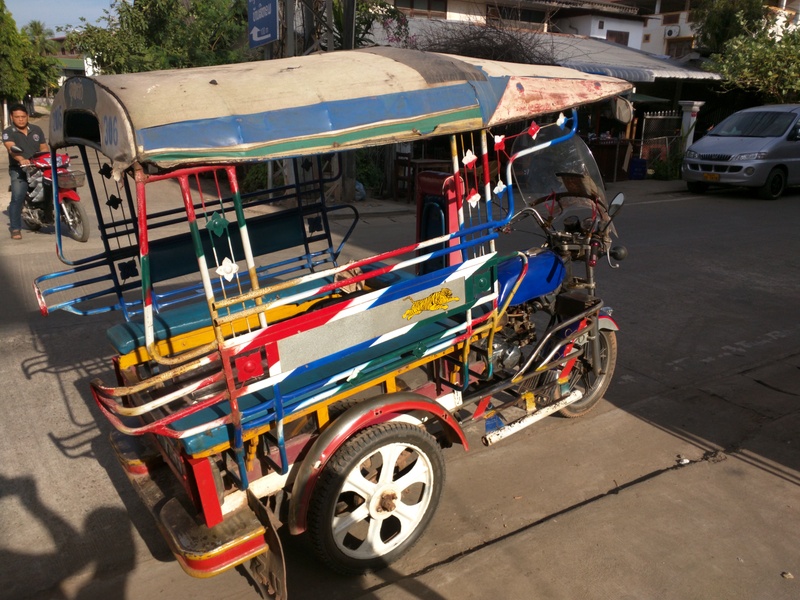 Since Vientiane is pretty small it’s a great place to explore on foot or bicycle. 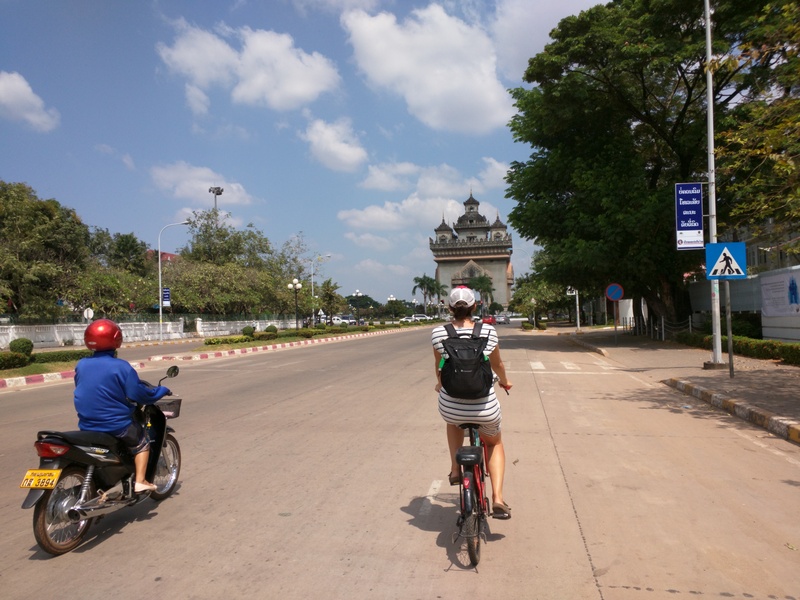 We rented bikes from our hostel and rode around the city seeing the main sites. 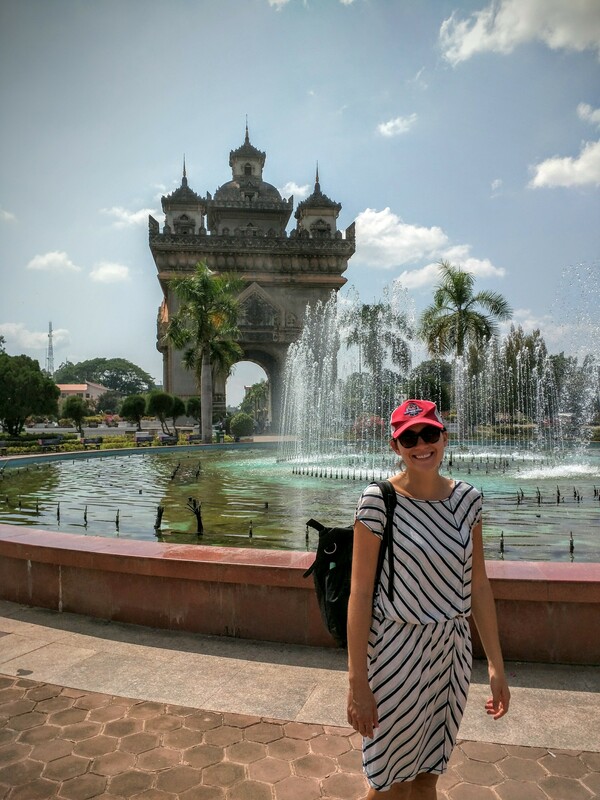 Vientiane has a replica of the Arc de Triomphe and a large street that leads up to the building that people have referred to as the Champs D’Elysees of the east. (Fun Fact: They built the arc with concrete given to them by the US that was supposed to go towards building an airport.) You can climb to the top and get a good few of the city. Biking up the asian Champs D’Elysees. 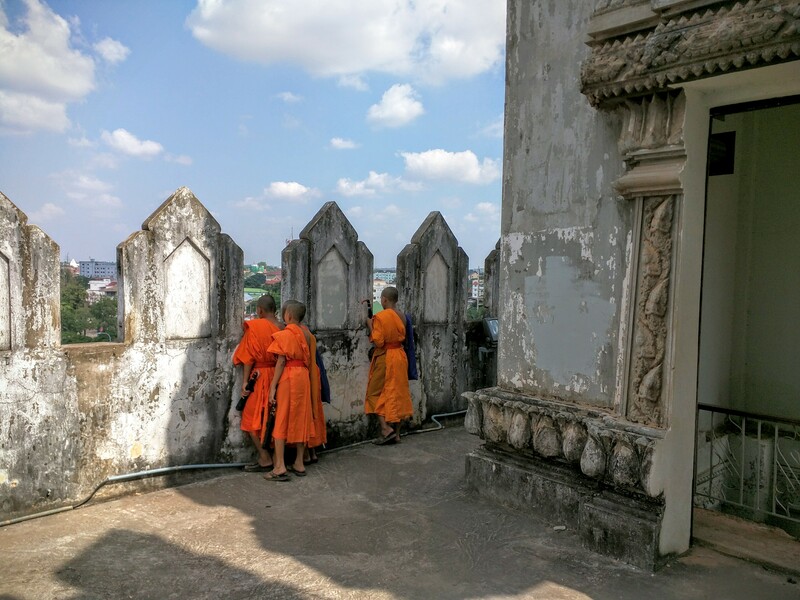 Laos monks overlooking the asian Arc de Triomphe. 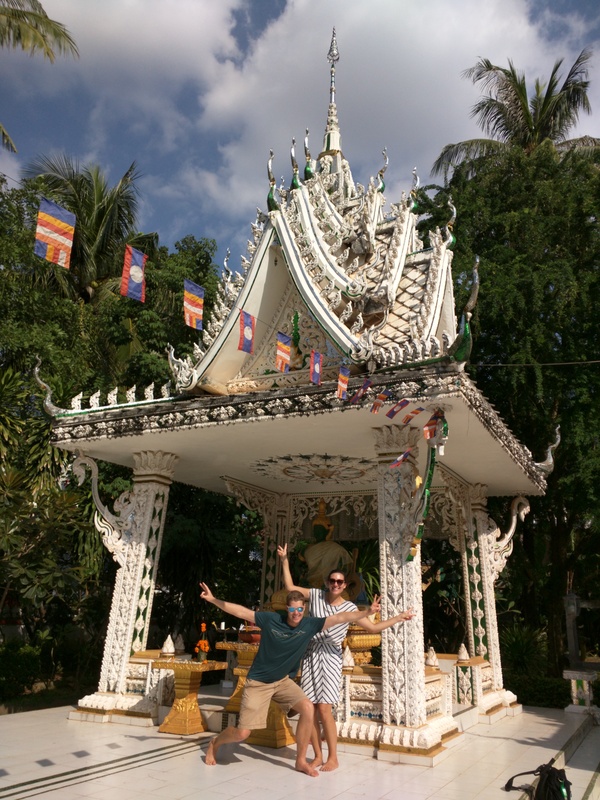 Vientiane also has a lot of Buddhist temples worth visiting that are within the city. 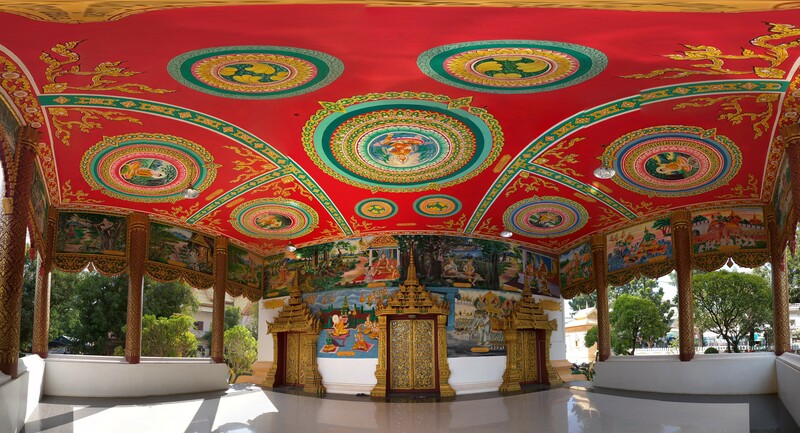 They are beautifully decorated with colorful paintings and statues. 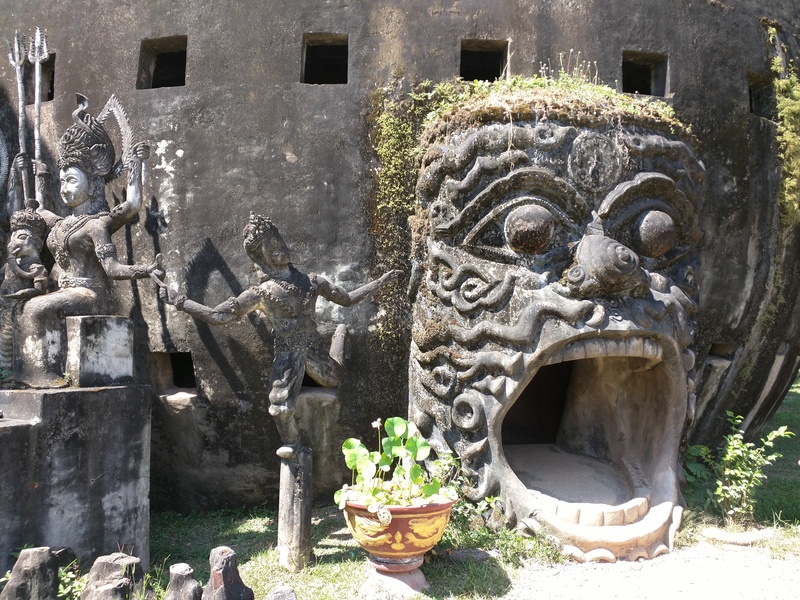 An interesting attraction outside of the city is a Buddha park where someone decided to take a plot of land and put up a bunch of Buddhist or Hindu statues. 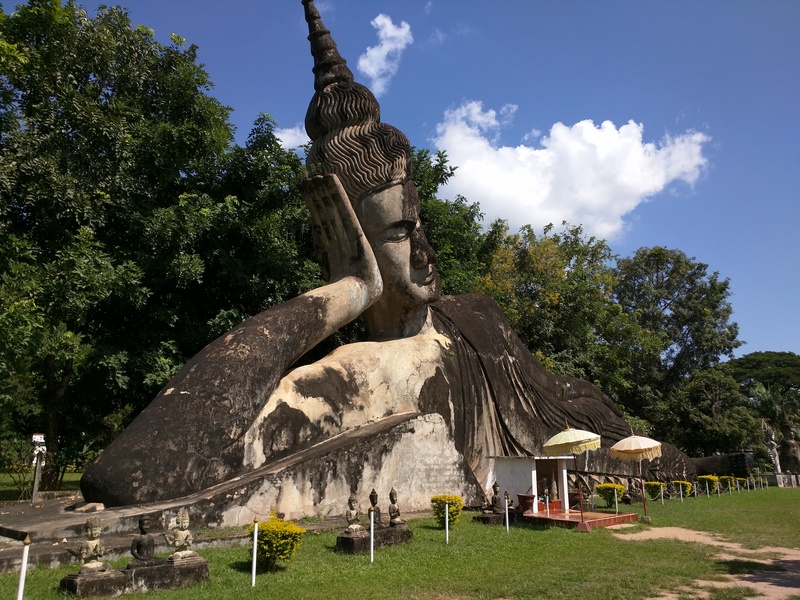 We took the public bus here so it was pretty cheap to see the park and entrance reasonable so it was worth seeing since we had some time but definitely not on the must see list of Vientiane. One of the highlights in the city is the COPE visitor center. COPE stands for Cooperative Orthotic and Prosthetic Enterprise and its mission is to provide prosthetics to people who can’t afford it. They started COPE for people who had lost limbs due to cluster bombs but have expanded to helping people with other disabilities. During the Vietnam war the US used cluster bombs to bomb Laos because the Northern Vietnamese were using Laos territory for supply routes and the Laos government was allowing this to occur. The visitor center is well done and isn’t too biased against the US which is refreshing. 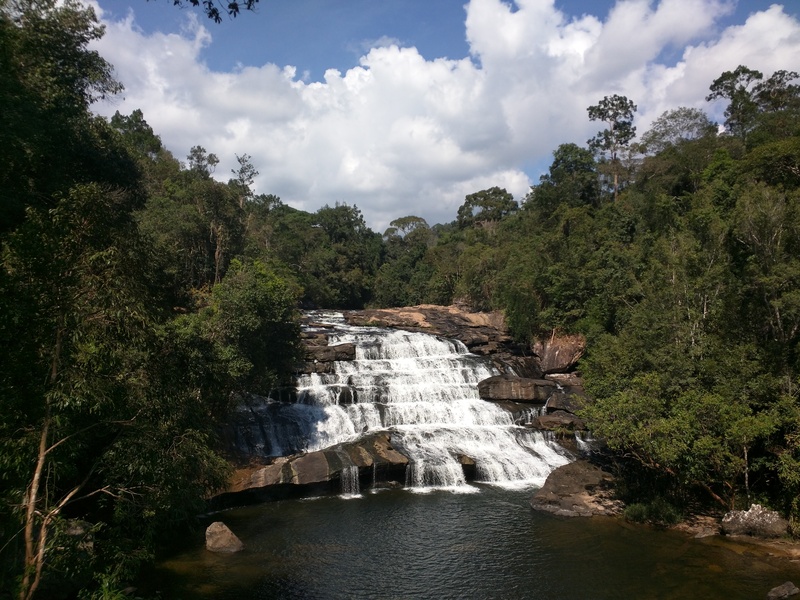 On the last day we booked a tour to go trekking in the Phou Khao Khouay National Park. This forest land is about 2 hours outside of the city and is home to many species of animals including elephants and sun bears (which we did not see on the trek (sad face)). Our tour started with a boat ride in a long boat which is super sketch since the boat is so skinny and once all 5 of were in the boat it is only like 1 inch above the water line. Fortunately we did not fall in or get wet. 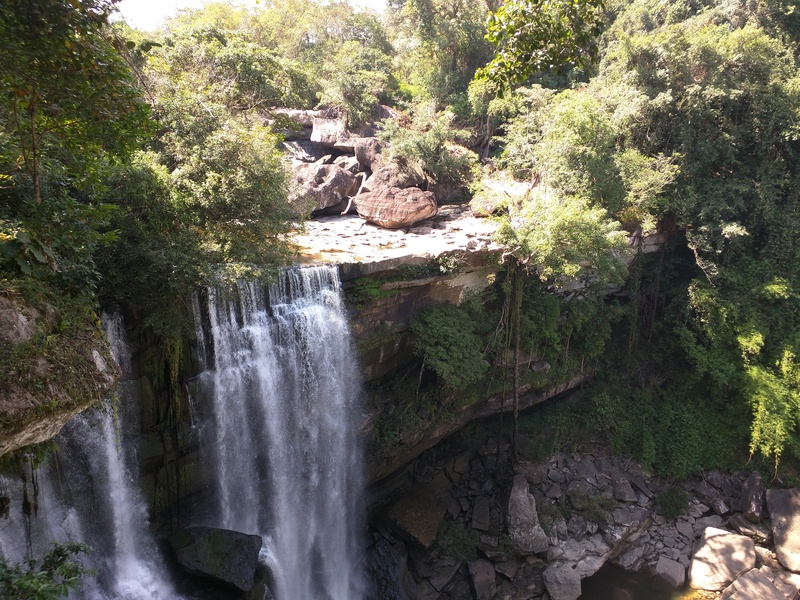 The second part of the tour consisted of trekking through the Laos jungle and through tons of bamboo. Our guide (who was hiking in flip flops) set a pretty vigorous pace so by the time we got to the end of the trek we were all drenched and sweating profusely. The trek ended at two waterfalls and at the second waterfall we were able to swim in the cold water which was amazing after our run/trek through the jungle. Vientiane also had some pretty great food. There is a good mix of western food (when you need a break from Asian street food), street food, other Asian foods like Japanese and Vietnamese and Laotian cuisine. One of our favorite Lao meals we had was at Lao kitchen where we had Laab and this crazy stew that had buffalo skin and pepper bark. Even with the crazy ingredients the stew was pretty tasty. All Laotian food is served with super sticky rice that they serve in a wicker basket. You take the sticky rice and dip it in your food and eat with your hands. As for drinks the Laotians basically only drink two things BeerLao (90% of the country prefers BeerLao as drink of choice) or rice whiskey. We ended up trying some rice whiskey and it is straight fire water, definitely have a chaser if you ever end up ordering it! Here is our ride to the airport.